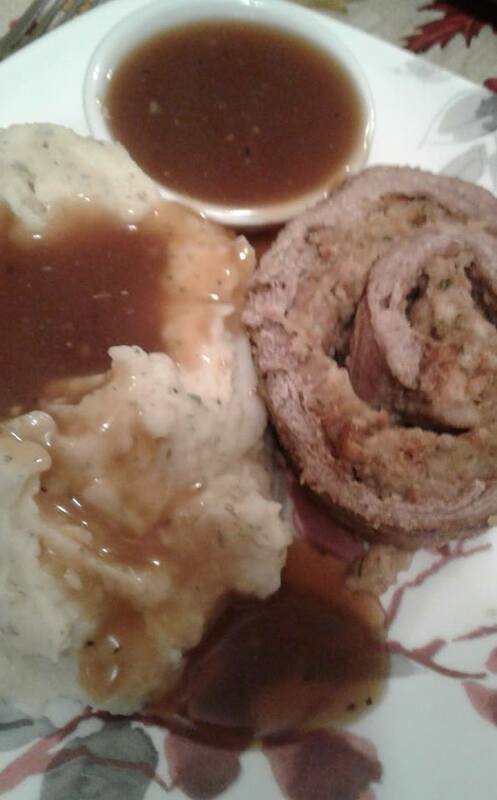 Rolled Stuffed Roast with Garlic Mashed and Gravy.. Its one of those “I love you babe” meals to my hubby.. This photo is of his plate.. No veggies required, just extra gravy please. I have a few different things thawing out in the fridge in regards to our farms meat, one of them was a very small uneven roast.. Those pretty roasts you get at the store are all neatly trimmed, this cut of meat would have most likely ended up stew meat or thin quick cook steaks if gotten at the store. I was trying to decide what to make with it, I already had a massive pot of potato ready to go, I wanted to put lots of cold cooked spuds in the fridge for later use. Saturday was a cooler day, it was a hunt for the goat morning, a supply run around in town and then a working afternoon with saws, hammers, ladders and screwdrivers. I wanted to be able to put dinner in the oven and forget about it while I got a bit of late fall mowing in. The plants had dropped their seeds and I could finally give that area a trim without effecting next years crop. I went.. hmm stuffed rolled roast! out came the knife to slice it open, the meat whacker (I used the line side) and flattened it out as much as possible.. it gave me a very uneven piece of meat but I just kept working it till I knew it could come together if it was tightly wrapped in a piece of tinfoil for the baking.. This was not a pretty one that tieing off was going to get the job done. Made the stuffing and rolled it up and into the tinfoil it went.. rolled tightly, and end side down and into a 375 oven.. It smelled awesome filling the house with this yummy scents. I took some of the potato’s and whipped them into a creamy garlic mashed and made a pot of beef gravy with a mix of the beef drippings/potato water with some bone broth. Honestly, I should have added veggies to this, but it was late, I was tired and we were having fresh fruit for dessert.. sometimes you need to look at the whole day’s menu’s for balance. Stuffed rolled roast is a easy way to create a meal that is going to make your meat eaters happy for a moist flavourful dish. Do give it a try! 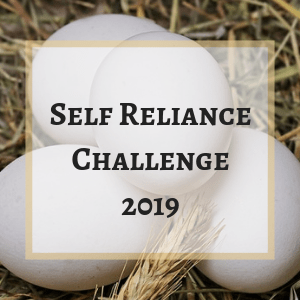 When you are trying to eat off your own land, sometimes you have to look at the entire year’s menu for balance. 🙂 Each season brings it’s own bounty of certain foods, and cold weather usually means a lot of meat and root veg. Nothing wrong with a meat and potatoes kind of day, especially if you have been eating heavy on the fresh greens and fruit all summer. That sounds so good. As the harvest season ends your freezer space must get crowded. We used to raise and butcher our own turkeys. A friend taught me how to make my own turkey roasts. Separate one-half a breast from the bone, bone one thigh. A nice combo of white and dark meat to satisfy everyone. Repeat with other breast and thigh. Melt some butter and mince a few cloves of garlic. Spread butter mix in middle of the roast. You can add salt and pepper now or wait till you roast. Have twine and scissors ready. Combine one breast, one thigh and tie. Repeat the same with other breast and thigh. We used to go to our local butcher’s and get the netting, much quicker than using twine. Depending on the size of your turkey you end up with 2 7-9 lb. roasts. You can use the rest of the turkey for broth or make soup.to pressure can. Sure saves a lot of space. Just thaw and roast. Also very glad that your goat hunting turned out well and he is home safe. Mmm… Rouladen, yumm!! Best thing though? You can always pack the dressing with all kinds of herbs, shredded carrot, minced onion & celery and STILL get all the veg you need. Or (he’s not listening right? ; ) precook and then smash some cauliflower to smithereens before stirring into your mashed potatoes (that you cooked with a few cloves of garlic: ) along with a load of shredded cheese and you’ve got what we called Cheesy Garlic Cauli-Taters… Delicious!